New Orleans is the #1 food destination in the USA. The question is, are you hungry for it’s delicious seafood?! If your answer is YES then it’s time to book Tastebud Tour’s Original New Orleans Seafood and History Food Tour. Take an unforgettable stroll through the streets of the Cresent City immersing your taste buds to some of the best seafood NOLA has to offer while your professional guide shares stories behind it’s iconic cuisine. Come Hungry! There’s no better way to start your visit than with the ultimate SEAFOOD food tour. Walk and eat your way through the streets of the French Quarter and visit Jackson Square in the heart of the city while your foodie guide entertains you with fun facts and points out famous sights. Located in the heart of the French quarter Tujague’s celebrates 160 years of serving Creole cuisine. Get ready to enjoy their famous dishes, Shrimp Remoulade and Goat Cheese Crepe served with an unforgettable Chardonnay Creole Cream Sauce. A true Tastebud delight! Drink specials are available for purchase. With the only daily jazz brunch in town, Court of Two Sisters is famed for its beautiful wisteria-blanketed courtyard and soothing fountains. This history-rich, two-centuries-old restaurant is a must do for any first-time visitor to the Crescent City; enjoy a stroll through the famous courtyard. Get ready to treat your ‘buds to some Creole Seafood Gumbo. Local brews are available should you enjoy one with your tasting. Local brews are available for purchase! Experience the local Flavor and Legendary Taste at The Cornet Restaurant, home of the largest balcony on Bourbon Street! Located on the corner of Bourbon and St. Peters streets in the heart of the French Quarter, Cornet serves authentic Cajun and Creole cuisine inspired by the cradle of Jazz. The restaurant was founded by the family who gave Louis Armstrong his first horn, a cornet. The menu has been designed to celebrate the sounds and flavors of New Orleans. Get your Taste buds ready for delicious Alligator and Blackened Catfish. You may want to purchase a special drink for this Balcony experience! 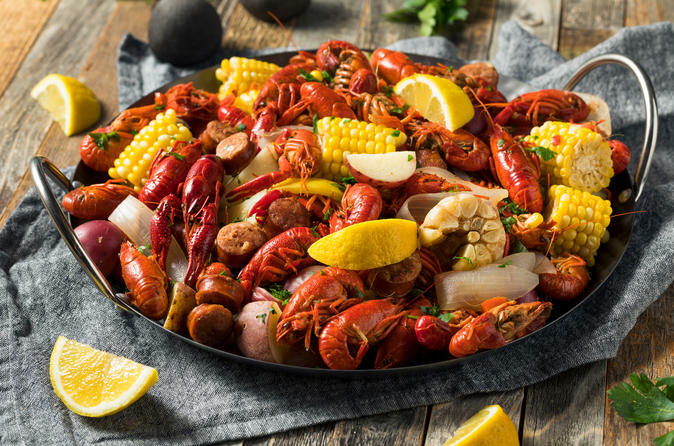 Classic Cajun and Creole cuisine has been the calling card here since 1894. We’ll try the Shrimp and Crab cake that Guy Fieri featured on Diners, Drive-ins and Dives. Additionally, Chef Dustin has a serving of Miss Pearl's Famous bread pudding that has been made the same way for 50 years!!! A real Tastebud delight! Nestled in the historic French Quarter, the Creole pralines and hand-dipped chocolates here are made fresh daily with recipes that date back to the 18th century. New Orleans’ oldest candy store is still going strong. You’ll surely be ready to end this tour on a sweet note! We’ll give you a special surprise to take along with you once your tour is over!